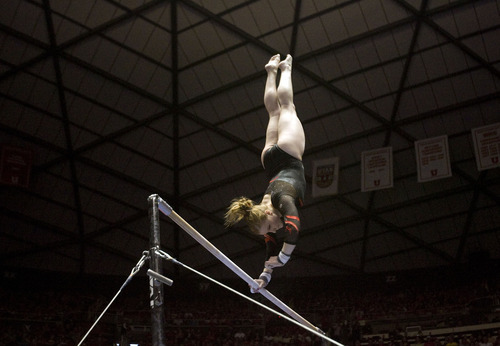 Dabritz excelling on uneven bars, Wilson unbeaten on vault heading into Pac-12 championships. Kim Raff | The Salt Lake Tribune Utah gymnast Tory Wilson performs her routine on the uneven bars during a meet against Florida at the Huntsman Center in Salt Lake City on March 16, 2013. Utah went on to beat Florida in the meet. Scott Sommerdorf | The Salt Lake Tribune Utah's Tory Wilson hits a 9.950 performance on the vault. She won individual titles in vault, beam and all-around as The Utah Red Rocks won a tri meet versus BYU and North Carolina State at BYU, Friday, March 1, 2013. Utah finished with 197.125 points to BYU's 195.000, and N.C.St. with 194.675. Kim Raff | The Salt Lake Tribune Utah gymnast Georgia Dabritz celebrates with her teammates after receiving a 10.00 for her routine on the uneven bars a during a meet against Florida at the Huntsman Center in Salt Lake City on March 16, 2013. Win and forget about it, win and forget about it, win and, well, you get the point. 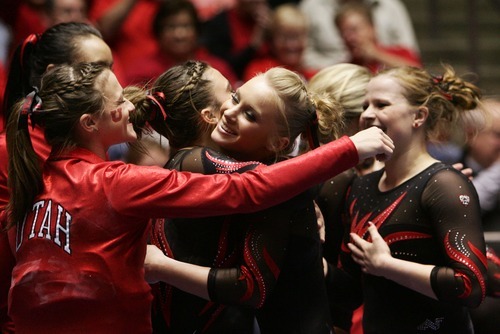 Every week Utah sophomore Tory Wilson has won or tied for the vault title. After every one she has tried to forget about the accomplishment, putting it aside and focusing on the next chance as if it were her first opportunity to win. Now that the postseason is here, it&apos;s hard to ignore the accomplishments she has made and the chances ahead, starting with Saturday&apos;s Pac-12 Championships. Utah&apos;s gymnastics program became the first to win a title in the Pac-12 when Corrie Lothrop won the all-around title and Georgia Dabritz won the uneven bars title a year ago. With Lothrop sidelined this year, Wilson, Dabritz and Becky Tutka appear to be the Utes&apos; best hopes for individual recognition. Out of those, Wilson is the one getting most of the pre-meet hype, thanks to her undefeated run on the vault. 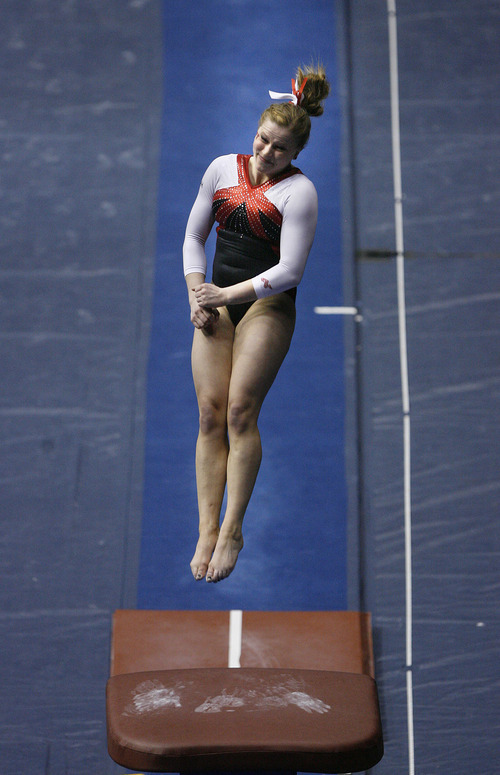 She is the first Utah gymnast to go undefeated on an event through the regular season, and she needs two wins to tie Theresa Kulikowski&apos;s effort of winning 12 titles she set in 2001 on the uneven bars. Wilson&apos;s best chances are at the Pac-12 Championships and at the NCAA Regionals, since she doesn&apos;t have to qualify separately for vault finals like she must at the NCAA Championships. Wilson is averaging a 9.96 on the vault, the same score as UCLA&apos;s Vanessa Zamarripa. Oregon State&apos;s Kelsie Blalock would be the next logical threat since she is ranked sixth, averaging 9.92. Wilson is trying to deflect any pressure to win by using the same attitude that brought her here. "It&apos;s an exciting opportunity, but I don&apos;t want to think about it too much," she said. "Eventually, I know I am going to take a step one day." As for Dabritz, she will be one of the favorites for the uneven bars. She won the title as a freshman and has won seven titles this season. She is tied for seventh nationally with a 9.91 average. Zamarripa, ranked fourth with a 9.925 average, and Oregon State&apos;s Makayla Stambaugh, who is ranked fifth with a 9.92 average, are other favorites. "I would like to win, but there are a lot of girls who can win that category," Dabritz said. "It is the same story in the all-around, too. It would be great to win, but there is a lot of competition." Zamarripa is ranked No. 1 in the all-around with a 39.63 average, and Stambaugh is No. 9 with a 39.49 average. Dabritz is No. 20 with a 39.365 average. Her lower average is due mainly to midseason struggles on the balance beam. However, she has improved in the last two meets, earning a 9.775 and 9.8. The last effort helped her win the all-around against Florida with a 39.7 average. Even though she feels capable of pulling out a big score Saturday, Dabritz acknowledged the competition is good enough that even a big effort may not do the trick. "Vanessa is a rock  she has great form on her landings and things like that," she said. "That is what it is going to come down to, landings and form. You are going to need those to get that half a tenth more to win."